Paid search is a wonderful advertising platform because it gives you clear-cut analytics for ROI decisions. Twitter, on the other hand, is a wonderful advertising platform because it is still natural and fun. Both paid search and Twitter advertising differ in scope and functional use in the marketing mix; however, Twitter recently announced a tool called the “Follower Dashboard”, which, in conjunction with geo-targeted ads, makes Twitter a very attractive advertising medium. Twitter announced the ability for companies to pay for “Promoted Tweets” earlier in 2010, where Coca-Cola garnered 86 million impressions with a single promoted tweet. Holy! Okay, sure Coca-Cola probably paid out the “Wah-Zoo” for that tweet, but even if they paid half a million dollars (ex: cost-per-engagement, or CPE, at $.10 & $6.06 per 1,000 impressions) for that promoted tweet, it would still be competitive with a paid search of $10 CPA. Okay, Twitter is great, we know. But up until now it was only great for big business marketing budgets. 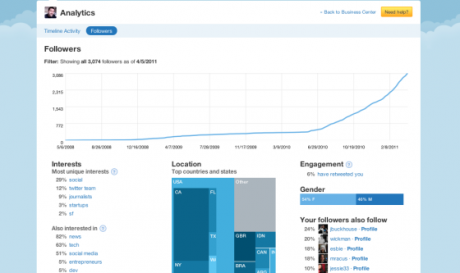 What makes Twitter Follower Dashboard so special? Engagement %: The percentage of people who have seen your tweet/ the number of people who have retweeted, replied or favorited your tweets. Your Followers Also Follow: A traditional display of who your followers also follow. Gender: The number and percentage of each gender that follow your account. Location: This gives a graphical analysis of the top countries and states that follow your account. Interests: Gives you the percentage of followers uniquely interested in various topics. Follower Graph: A graph that shows the growth of your Twitter account followers. Just a look at these features may leave you wondering: so where’s the “hard” CPE, revenue, and advertising data? How do I calculate my ROI? Before you begin to ask all that, though – think about it: this dashboard may be simple, but it is proprietary. 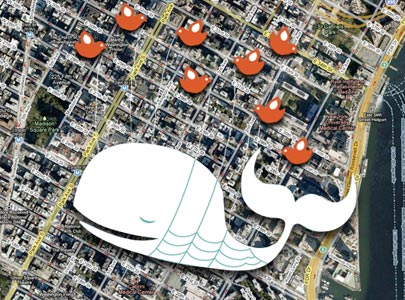 Twitter undoubtedly will begin to roll out additional features to ramp up their dashboard. This is just a small step to ultimately allowing small- and medium-sized businesses more marketing opportunities on Twitter. In addition to this dashboard, we will likely see small- and medium-sized businesses start to seriously consider Twitter’s ad platform. Currently, cost-per-engagement is averaging between $.10 and $.50, while cost-per-follower can run anywhere from $.50 to $2.00! However, what many businesses don’t know is that their CPE is pretty competitive and sometimes lower than paid search. This tool is aimed to be used in conjunction with a geo-relevant ad strategy. If your small business is really establishing a following in Milwaukee, it may not be the best idea to promote your tweets in Chicago. The Follower Dashboard will be able to segment your current following, giving insight in to future opportunities. This, of course, requires an already established Twitter account, and it’s not recommended to jump in to a promoted tweet on a brand new Twitter account. Eventually, there will be a full-service solution for advertising on Twitter, with geo-relevance and full dashboard analytics, but Twitter right now is still very delicate about their advertising. With only $45 million in revenue for 2010, Twitter is an ad product that rewards marketers for being “good” – and not just for being loud. A differentiated strategy that may work well for big businesses now, but which eventually will be perfect for small or medium geo-relevant businesses. About the author: Matt Krautstrunk is an expert writer on business security systems based in San Diego, California. He writes extensively for an online resource that provides expert advice on purchasing and outsourcing decisions for small business owners and entrepreneurs such as access control systems at Resource Nation.